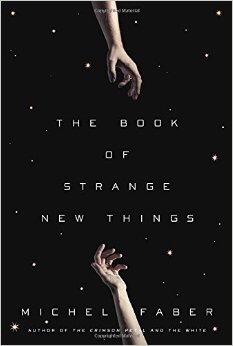 The Book of Strange New Things is a melancholy novel about love and devastation. That might sound like a contradiction in terms, but Faber approaches the well-worn territory of inter-species colonialism with a gentle, sad touch that makes some very old tropes feel new again. This was written as Faber’s wife was dying, and a desperate longing for the restoration of someone in your life you can feel slipping away from you makes the Book of Strange New Things a sad but memorable read. It might be a sign of the times that a novel exploring religion and aliens has received rave reviews — would it have twenty years ago, when the lines between “literature” and genre-novels were more obvious? Probably not. This change is for the better:Peter, the protagonist, is a Christian missionary sent to outer space. Letters to and from his wife punctuate the narrative; back on Earth things are falling apart. Meanwhile, we watch as the inhabitants of this new planet adopt a religion they might not understand and the strange world begins to shake Peter’s faith. When talking about all of this, genre definitions are stretched in usefulness. It’s sci-fi, true; but there are many who might hear that and therefore dismiss this book, putting it in a box where they perceive human emotions as being secondary in importance. There’s a literary resonance here reminiscent of Ursula Le Guin, and a nuanced approach to religion that should intrigue fans of sci-fi, literary fiction readers, believers and (thankfully for me) non-believers alike.